Paint in sections if you get overwhelmed easily. Moss growth on roofs will shorten its lifespan and potentially cause moisture problems. Sometimes regular inspection reveals bigger problems. 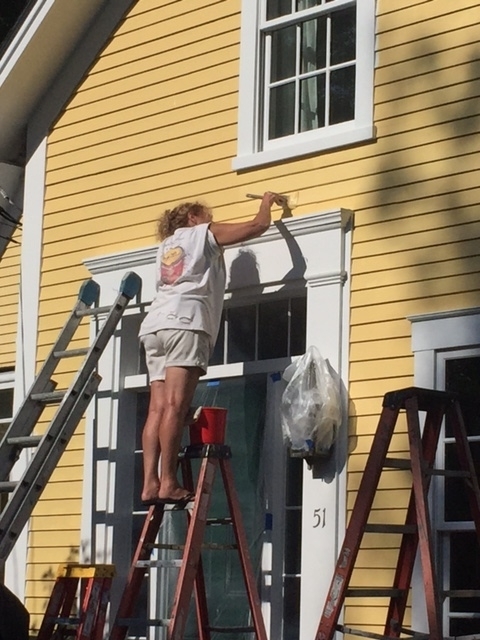 Summer isn't over yet so there's still time to work on your old house to-do list. Every old house has a laundry list of work items, from painting to window repair to finally re-installing that trim in the upstairs bedroom. It can be overwhelming. Or maybe your insurance company is calling the shots. We talked to Dale Barney, of Barney Insurance in Canaan, about what insurance companies want to see with older houses. "If homeowners want preferred policies, make sure your house is well-cared for and well-maintained." That means no peeling paint, no curling roof shingles, and no rickety stair railings. Insurance companies inspect properties every five years on average. Making your house look good can save you hundreds of dollars on homeowners insurance. Spend time clearing vegetation away from the perimeter of the house and barn. Foliage and roots trap moisture against siding and their roots can cause foundation issues. Trim back tree branches that reach over roofs, which can foster environments for moss growth (you can later kill moss with baking soda). Inspect and clean your gutters while you're up on the roof. Keeping your gutters free of leaves and dirt prevents moisture issues down on the ground. Gently washing dirt and mold growth off wood siding and trim also helps extend the life of your house's paint job and clapboards. Gentle is the key word here. Instead of power washing your siding, use mild soap and TSP substitute. You could easily spend your weekend hours working on your old house. (Many of us here at the Alliance can attest to this.) Dividing your house into manageable sections can give you a sense of satisfaction without draining your spare time and wallet. Tackle one elevation of your house or barn at a time. Spend a few hours here and there cleaning siding or painting trim. Cut up just one load of brush a weekend. Over time, these smaller efforts pay off. "I use benchmarks in my house's restoration as an excuse to invite people over," admits our field service representative, Andrew Cushing. "When the porch was done, I had a porch party. When the yard was mostly cleared, I had a bonfire. The affirmation helps, but so does the clear timeline to finish projects." Do you have tips for staying sane with summer maintenance? Share them with us.